In the early morning of August 5th, a 6.9 magnitude earthquake shook the Indonesian province of West Nusa Tenggara. Here’s what we know. 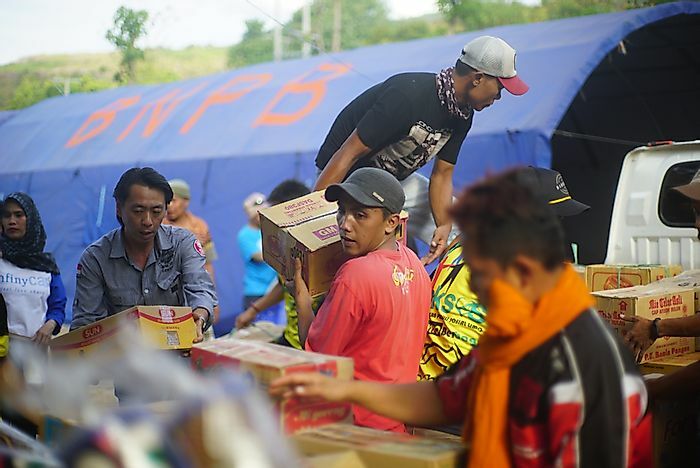 Volunteers in Lombok, Indonesia work hard to get supplies to victims of the 2018 earthquake. Editorial credit: raditya / Shutterstock.com. Where and When Was the Earthquake? The recent Indonesian earthquake took place on the island of Lombok in West Nusa Tenggara, a popular tourist destination. The 6.9-magnitude earthquake triggered massive landslides from the nearby 12,224-foot Mount Rinjani. The disaster happened on the Sunday of August 5, 2018, shortly after a 6.4-magnitude earthquake hit the island on July 29, which led to the death of 17 people as well as hundreds of injuries. The National Disaster Mitigation Agency (BNPB) estimates that the death toll was at least 91 people as of August 6. Unfortunately, the number is expected to rise as the evacuation work is completed. The number of injured is estimated at 209. Thousands of buildings were destroyed as well as the destruction of power, transport, and communication lines. The powerful tremor was felt all the way to the nearby island of Bali where two people were reported dead. As the island is a popular tourist destination, the Indonesian authorities have improved their efforts to ensure that panicked tourists get a chance to get out of the country. There were long lines of tourists at the island’s main town, Mataram, which prompted airlines such as the Garuda Indonesia airline and others to add extra flights to accommodate the number. A priority has been placed on providing shelter for the thousands of misplaced residents, and helicopters and aircraft have been brought in to deliver aid as all roads are damaged and inaccessible. What Are the Chances of Another Earthquake Happening? The chances of another earthquake are high. Within a span of a week, two powerful earthquakes have hit the island. In both cases, there were at least 100 aftershocks felt. Indonesia lies on the deadly Pacific Ring of Fire, which is a region of powerful seismic and volcanic action. The last time Indonesia had an earthquake of similar magnitude was in December 2017 when a 6.5-magnitude earthquake hit Java, resulting in four deaths and numerous injuries.